I find it helpful to think in terms of market cycles, rather than trends. 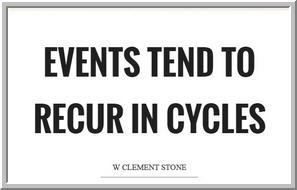 A cycle consists of both trending and non-trending components. Understanding where we're at in cycles helps us identify whether we want to be going with strength or weakness or whether we want to fade these. Once we think in cycles, it's silly to identify ourselves as trend traders or counter-trend traders. Our job is to profit from the various phases of market cycles, not try to make market activity fit our predetermined trading preference. 1) Market Momentum Bottom - Here is where we wash out on elevated volume, with a maximum number of stocks registering fresh new lows. Volatility is high and correlation is high, as the great majority of stocks and sectors are participating in the decline. An example of a market momentum low was January 20, 2016, when we dropped on high volume with over 2600 stocks across all exchanges registering fresh three-month lows. 2) Market Bottoming - The extreme selling brings in value buyers and we get a sharp bounce from the market lows, followed by further attempts at selling. At major market lows, this bottoming process can occur over a period of weeks or more; at intermediate lows, it may occur over subsequent days. An example of a bottoming process was the bounce into the beginning of February, 2016 followed by a decline to new closing price lows on February 11th. Only 1353 stocks made fresh three-month lows at that time, showing that selling pressure was having difficulty moving the great majority of shares lower. 3) Bull Momentum Phase - With the inability of sellers to move the majority of stocks lower, value buyers return with a vengeance aided by short-covering and that moves the market steadily higher. Volume and volatility are still high, with the vast majority of stocks lifted off their lows. In this phase, we often look for pullbacks but get none of great magnitude, as momentum enables strength to follow from strength. A good example of a momentum phase was the sharp move of stocks higher from mid-February, 2016 through much of March and early April. 4) Bull Topping Phase - Here is where higher prices get to the point where the market is no longer attractive to value participants and bulls are relatively loaded up. This results in a drop of volume and relatively low levels of volatility. Correlations move lower as some sectors and stocks continue strong, while others begin to lag. Late in a topping phase, we can see the number of stocks making fresh short-term lows expand, even as the overall market averages are near their highs. A short topping phase occurred from mid-April, 2016 through early June. Over that time, price moved higher, but new three-month highs dropped from 1113 to 818. 5) Bear Momentum Phase - The inability of buyers to push the market to new highs attracts the participation of sellers and volume and volatility once again pick up. The market can remain oversold for a while, as bulls exit their positions and shorts are emboldened. Correlations rise, and we move toward a market momentum bottom. The market demonstrated an intermediate bear momentum phase from early June, 2016 to late June. At that bottom, we did not see an elaborated bottoming process. When a pullback occurred, it was from a higher price point and resulted in a higher price low. This led to a quick rally higher into August. As a rule, the longer the bear market phase and bottoming processes, the longer the subsequent rally. The longer the bull topping phase, the more extreme the subsequent bear phase. When more market participants are trapped short or long, the unwinds tend to be greater. Cycle structure can provide us with a road map for gauging where we stand with respect to "overbought" and "oversold" markets and the likelihood that strength or weakness will continue or reverse. I use cycles less for predicting markets than understanding them. Knowing where we're at in a market cycle helps us avoid chasing markets at the wrong time and also helps us avoid standing aside during the market's periods of momentum. Most of the indicators I track are ways of gauging day to day strength and weakness and updating where we stand in terms of cycle structure. At present, we see volume and volatility at relatively low levels and small cap shares underperforming large caps. That has contributed to a rise in the number of stocks registering fresh short-term lows. For example, on Monday we had 520 stocks across all exchanges make new monthly highs, but 694 register fresh monthly lows. Technology shares have made new highs, but many sectors remain below their peaks. All of that raises the odds that we're at a relatively late, topping period in the recent bull cycle.